The root of the perennial herbaceous plants Angelica sinensis (Oliv.) Diele of family Umbelliferae. Gansu, Sichuan and Shaanxi provinces in China. Strong fragrance, sweet, pungent and slightly bitter. Brown-yellow cover, full, white cross section. Sweet, pungent, warm, heart and liver meridians entered. Tonify blood, activate blood, alleviate pain, regulate menstruation, and moisten intestines. It is an essential herb to tonify blood and indicated for all kinds of blood deficiency syndromes, especially for blood deficiency with blood stasis because it is skilled in tonifying blood. For sallow complexion, vertigo and palpitation caused by blood deficiency, it is combined with other blood-tonifying and symptoms-suiting herbs, for instance, it is used with Shu Di Huang, Chuan Xiong, and Bai Shao in the formula Si Wu Tang from Tai Ping Hui Min He Ji Ju Fang. 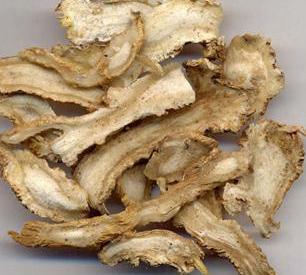 For palpitation, insomnia, dream-disturbed sleep, amnesia, and other symptoms caused by insufficiency of heart due to blood deficiency, it is combined with other heart-nourishing and tranquilizing herbs, for instance, it is used with Suan Zao Ren and Bai Zi Ren in the formula Tian Wang Bu Xin Dan from She Sheng Mi Pou. For blood deficiency with qi deficiency, it is combined with other qi tonics, for instance, it is used with Huang Qi in the formula Dang Gui Bu Xue Tang from Nei Wai Shang Bian Huo Lun. It is indicated for all kinds of pain syndromes caused by blood deficiency, blood stasis and congealing cold with blood stasis because it can tonify blood, activate blood, dispel cold and alleviate pain. The combinations are variously based on different pain causes, for abdomen pain due to blood deficiency with cold pathogen, it is combined with interior-warming ancl cold-dispelling herbs, for instance, it is used with Sheng Jiang, and Yang Rou in the formula Dang Gui Sheng Jiang Yang Rou Tang from Jin Kui Yao Lue. For pain arthralgia due to congealing cold and obstruction of blood vessels, it is combined with other cold-dispelling and blood-vessel-smoothing herbs, for instance, it is used with Gui Zhi and Chuan Mu Tong in the formula Dang Gui Si Ni Tang from Shang Han Lun. For hematoma, swelling and pain due to falling, hitting, and other injuries, it is combined with other blood-activating, pain-alleviating and injury-curing herbs, for instance, it is used with Ru Xiang, Su Mu and Tu Bie Chong in the formula Huo Xue Zhi Tong Tang from Shang Ke Da Cheng (Complete Book of Traumatology). It is an essential herb in gynecology and indicated for irregular menstruation, amenorrhea and dysmenorrhea because it can tonify blood, activate blood, regulate menstruation and alleviate pain. It is especial in these symptoms due to blood deficiency, blood stasis and cold congealment. For delayed menstruation, little quantity in pale color, it is combined with herbs, such as Shu Di Huang, and Bai Shao in the formula Si Wu Tang which is skilled in tonifying blood and regulating menstruation. For menstrual diseases due to blood deficiency, blood stasis and congealing cold, it is combined with other meridians-warming and cold-dispersing herbs, for instance, it is used with Wu Zhu Yu and Gui Zhi in the formula Wen Jing Tang from Jin Kui Yao Lue. For menstrual diseases due to liver depression, qi stagnation, blood stasis, it is combined with other liver-soothing ancl qi-regulating herbs, for instance, it is usecl with Chai Hu in the formula Xiao Yao San from Tai Ping Hui Min He Ji Ju Fang. Besides regulating menstruation, it is also indicated for all kinds of syndromes due to blood deficiency and blood .stasis Lefore or after delwery. It is indicated for ulcers, especially for ulcer without burst of pus or uncured ulcers due to blood deficiency, because it can promote blood circulation, remove swelling, alleviate pain, tonify blood, improve tissue generation, and it is warm in property but skilled in tonifying blood and healthy qi. It is combined with corresponding herbs in clinic. For ulcers and sores without burst of pus, it is combined with herbs of tonifying qi, expelling toxin and pus, and activating blood, for instance, it is used with Huang Qi, and Zao Jiao Ci in the formula Tou Nong San from Wai Ke Zheng Zong. For uncured ulcers and sores, it is combined with qi and blood tonics, for instance, it is used with Ren Shen, and Shu Di Huang in the formula Shi Quan Da Bu Tang from He Ji Ju Fang. For ulcers and sores due to excessive heat-toxin and manifested as red, swelling, hot, and pain, it should be applied in combinations. It is combined with herbs of clearing heat-toxin, removing swelling, and eliminating ulcer, for instance, it is used with Jin Yin Hua and Tian Hua Fen in the formula Xian Fang Huo Ming Yin from Jiao Zhu Fu Ren Liang Fang. It is indicated for constipation due to blood deficiency with intestinal dryness, because it can tonify blood and moisten dryness, nourish intestines to smooth stool. It is combined with blood-nourishing, dryness-moistening and stool-smoothing herbs, for instance, it is used with raw He Shou Wu and Huo Ma Ren. Besides, it is also indicated for cough and dyspnea because it can relieve dyspnea. Decoct 6~12 g. Commonly it is applied in raw material, but the one stir-baked with alcohol is for promoting blood circulation. It is contraindicated in cases of damp-heat stagnating in the middle, lung heat with phlegm fire, and yin deficiency with effulgent yang because it is warm and sweet in properties. In addition, it should be used with cautions in cases of loose stool because it can moisten intestines to smooth stool.